The Teddy Bear Boy Hidden Camera is the perfect device to protect your young ones. This dog comes in green. 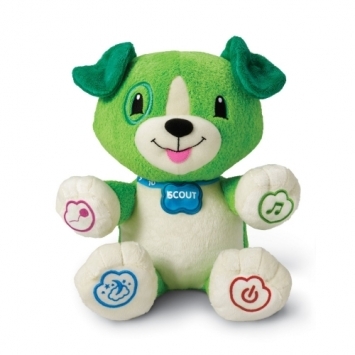 Whether you are making sure your child is staying out of trouble or keeping an eye on the babysitter, no one should suspect that this harmless stuffed dog is watching them! Completely covert. It looks like a typical stuffed dog. Even if the camera is handled by someone curious, the electronics are indistinguishable from the original electronics for making the dog talk. Please note however, that while the bear retains all of its original electronic functions, it is not a toy and is designed to be used as a security device. Quality video. Records VGA quality (1280 x 960) video. Either record continuously, or use the motion detection setting. Plentiful storage and battery life. Have to be away all day yet you don’t quite trust the new babysitter yet? The BBDog features a 10 hour battery and 16GB of internal memory. When you combine this with its motion detection capabilities you’re sure not to miss a single thing. Usually shipped in 24 to 48 hours business days.